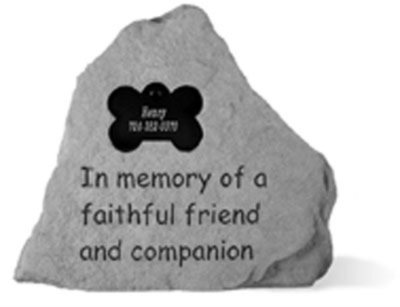 Kay Berry dog memorial made from cast stone in Ireland. All of the decorative stones have a hangar cast into the backs to allow display on walls, fences, or outbuildings. Stones have peel and stick adhesive in the recessed area for easy installation of tag. Tag is also supplied with the stone for you to get engraved locally.